There’s some great news today for fans of NBC‘s Superstore as the network has revealed that the Justin Spitzer comedy will return for a third season with another 22 half-hour episodes. 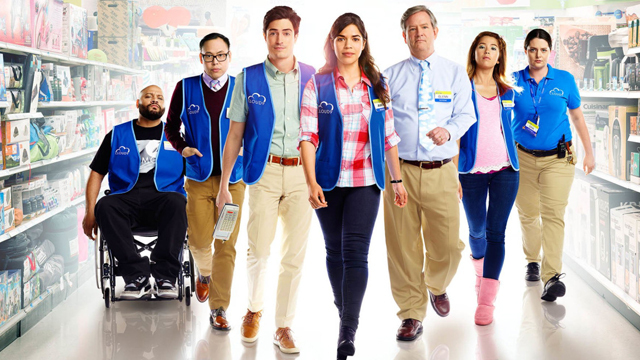 Superstore centers around Amy (America Ferrera), the store’s most stalwart employee as well as the glue holding the place together. Jonah (Ben Feldman), who is often the target of his colleagues ribbing, is joined on the floor with his fellow associates, including sardonic Garrett (Colton Dunn), the ambitious Mateo (Nico Santos) and sweet teenager and new mom Cheyenne (Nichole Bloom). Overseeing the store is Glenn (Mark McKinney), the affable, clueless store manager, and Dina (Lauren Ash), the aggressive assistant manager who enforces Cloud 9 policy with an iron fist. So far this season, Superstore originals have averaged a 1.8 rating in adults 18-49 and 5.7 million viewers overall in “live plus seven day” ratings from Nielsen Media Research, lifting the network +29% above its 1.4 average in the Thursday 8 p.m. half-hour last season in 18-49 (excluding sports). Last summer a special post-Olympic telecast of Superstore delivered 9.7 million viewers, making it broadcast TV’s most-watched Friday comedy in 12 years. Last season, Superstore ranked as NBC’s #1 show on digital platforms, generating more than 33 million full-episode views on Hulu, NBC.com and video on demand. Superstore was created and written by Justin Spitzer, who also serves as an executive producer with director Ruben Fleischer, David Bernad and Gabe Miller & Jonathan Green. Superstore is produced by Universal Television, Spitzer Holding Company and The District.